Introducing Uprisings, a brand new combat experience that will launch with the Knights of the Eternal Throne expansion on December 2nd. Be at the center of action-packed 4-player battles that challenge players of all skill levels. Once you hit maximum level, you can jump into Uprisings through the Galactic Command interface, accessible from anywhere in the game. If you want to learn more about Galactic Command, head to our overview blog located here. What sets Uprisings apart from other activities such as Flashpoints and Operations? It’s simple. Uprisings are meant to be faster-paced and action-packed combat adventures where you must fight through multiple enemies at a time as you work your way towards more challenging foes. 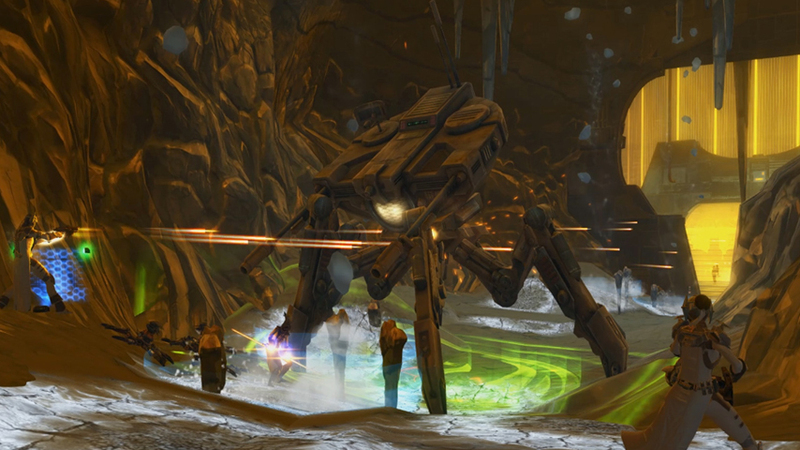 In Uprisings, you will jump into the action quickly, taking on some of the most dangerous foes in the galaxy. Those enemies have spawned these Uprisings, questioning the very power of your Alliance. With the launch of Knights of the Eternal Throne you can customize your level of challenge in any Uprising, choosing from multiple challenge modes including Story and Veteran. Veteran Uprisings will be among the most challenging battles in the game. If you can succeed, playing through a Veteran Uprising will be one of the greatest sources of Command Experience Points that contribute to your Command Level, allowing you to unlock increasingly more powerful gear, weapons and more. Tempest Rocket Launcher - Fires an unstable prototype missile that explodes on contact to unleash torrents of lightning in all directions. Enemies caught in the blaze are electrocuted and stunned for 3 seconds while continuing to sustain heavy damage. Additionally, the initial impact deals massive concussive damage, knocking enemies backwards and down to the floor. Thermal Devastator - The most powerful and feared explosive in the galaxy, the Thermal Devastator emits an incendiary concussive wave that sets enemies ablaze. While the initial impact sears foes in an all-consuming conflagration, the follow-up wave of force launches them through the air with bone-shattering force. Combat Clarity - For a brief period of time you will able to move faster and use your most powerful abilities with reckless abandon. With these power-ups at your disposal, you should be able to dispatch any Uprisings that appear throughout the Galaxy. Get ready to join your friends and guildmates in fast and challenging Uprisings!